Provide a CAD model from an aircraft sink. Our customer required a full scan & reverse model so they could manufacture a stainless steel upgrade on the tired and worn sink. We scanned the sink in situ using our FARO Edge ScanArm HD. Reverse engineered using SpaceClaim software. The surface was easily scanned with no issues. 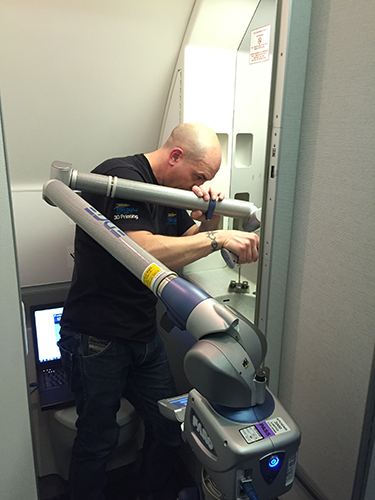 Space was more of an issue with the toilet area being so tight on an aircraft, I was able to get the tripod quite close and with good dexterity of the portable arm was able to capture all the data needed from the sink. Provided an on-site scanning service with extremely short notice.